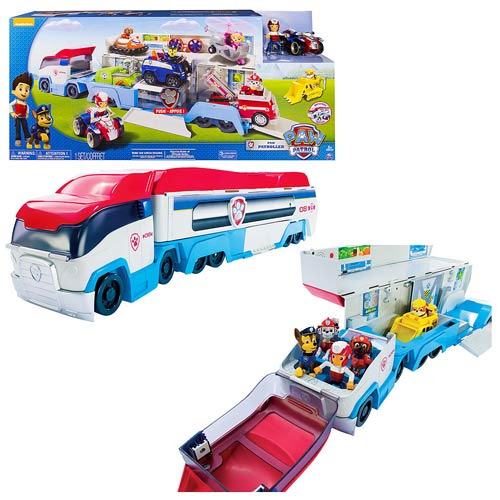 Your child will have a blast with the Paw Patrol Paw Patroller, which features a working elevator and a fully functional Command Center inside. Open up the front cab to sit four Paw Patrol pups in the driver's seat, and load up to three vehicles for transport. When not in motion, open the truck to display six pups and their vehicles! Land Skye and her chopper on the landing pad (sold separately), or use Ryder and his ATV to zoom off to the rescue. Your little one can listen to exciting Paw Patrol sounds with the push of a button to bring his or her favorite crime-fighting puppy friends to life! Includes Paw Patroller vehicle, Ryder figure, ATV vehicle, and sticker sheet! Comes complete with 3 "LR44" button cell batteries, required. Measures approximately 27-inches long and approximately 8 1/2-inches tall. Ages 3 and up.